MORGANTOWN, W.Va. – Two FBI workers are accused of using surveillance equipment to spy on teenage girls as they undressed and tried on prom gowns at a charity event at a West Virginia mall. The FBI employees have been charged with conspiracy and committing criminal invasion of privacy. They were working in an FBI satellite control room at the mall when they positioned a camera on temporary changing rooms and zoomed in for at least 90 minutes on girls dressing for the Cinderella Project fashion show, Marion County Prosecutor Pat Wilson said yesterday. Gary Sutton Jr., 40, of New Milton and Charles Hommema of Buckhannon have been charged with the misdemeanors and face fines and up to a year in jail on each charge if convicted. Sutton has been released on bond, Wilson said, and Hommema is to be arraigned later this week. The FBI issued a brief statement saying that its Office of Inspector General was investigating. Only a very thin difference between surveillance of kiddies in underwear and the “Caption this Photo” of teens in underwear. Am I a pervert in one case but not the other. YouTube video or it didn’t happen! 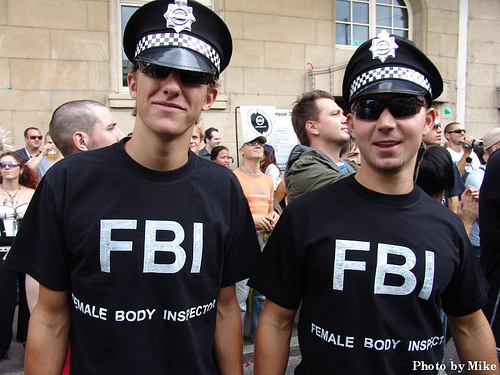 This is a sign that the FBI has been infiltrated with Liberals, otherwise they’d be caught watching strapping young men. What do you expect in a paranoid surveillance society. If you can trust the people, you certainly can’t trust the authorities. In the USA, governmental authority constitutionally comes from the people. If you don’t trust people, that’s the same as saying you don’t trust government. You can’t have it both ways, not trust people but trust governmental authority. Once public trust breaks down, as it appears to have started; this whole American Experiment will breakdown. Being American used to mean believing and caring in your fellow American. Now days, thanks in part to BUSH CO., we distrust everyone. America is no longer America; when, we turn on each other. Nothing has really happened until it has been recorded. — Virginia Woolf. #1 The difference is that in this case the girls were not aware of, nor consent to, being photographed. Huh? Are they talking about surveillance satellites? Were these temporary changing rooms open at the top? Were they watching via the satellites? Surely there must be cheaper places to rent offices than a shopping mall. This is just too weird all around. Inquiring minds want to know! #2 – Special Ed – YouTube video or it didn’t happen! What!? No Alfred leftist comment yet? AIG and Goldman Sachs are looting the treasury with the help of the Federal Reserve Bank (a private corporation) and the Treasury, no one has been charged, Wall Street is wall to wall with crooks, and the FBI spends its days spying on teenage girls in changing rooms at the malls. WTF has happened to this country, at one time the FBI had its own TV show and suave hollywood actors saved the nation weekly, now its a bunch of clowns who can’t get out of the way of their own feet. Its past time for some major changes in this nation, or we will never recover from this economic and stupidity collapse. Lets get the FBI out of the malls and into trading floors, how about a couple of those FBI guys watching Goldman Sachs 24/7, and I mean computer surveillance, not sitting in front of a tv watching a web cam. Lets find out who traded with whom, and who made those huge credit default swaps. I’m daily fatigued by the stupidity of the apparatus setup to govern me by taking 1/3 of my money. #1, bobbo, IMO… It’s not a perversion to appreciate a sexually mature female, especially if you are male. So I would say not guilty of perversion on both counts. I am sure those pesky West Virgins will some how try to blame this on Rich Rodriguez. So when did Federal privacy laws finally get enacted? What are they teaching them there at Quantico? I hoped the FBI were a little less corruptible, and if they were going to do something it would be less puerile than this. Huh, wha? They have FBI control rooms in -malls-? Why?! Is that really a good use of manpower? But those half naked teenage girls could have been terrorists!